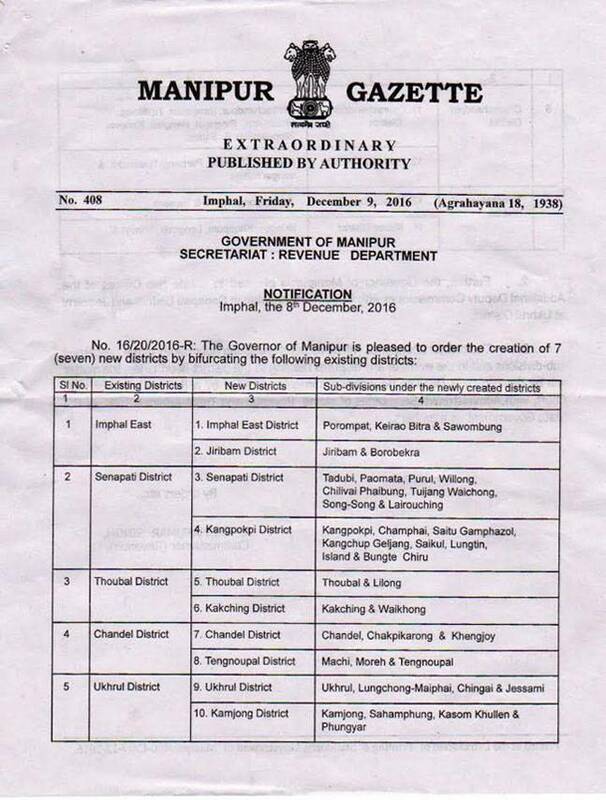 The newly-created districts are Tengnoupal, bifurcated from Channel district, Kampong from Ukhrul, Pherzawl from Churachandpur, Kangpokpi from Senapati and Jiribam from Imphal East districts. 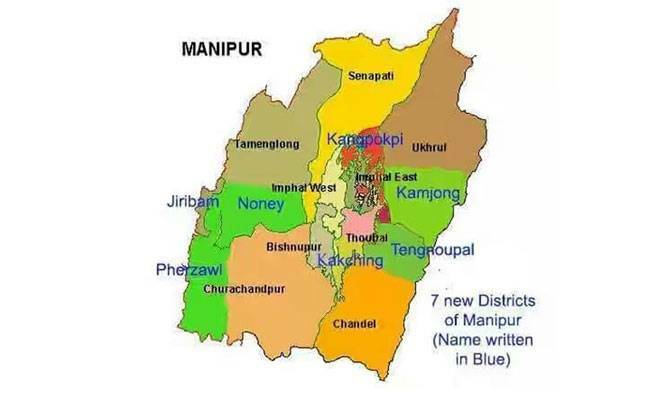 Manipur has now become a 16-district state, after 7 new districts were formed by dividing the 9 existing ones. 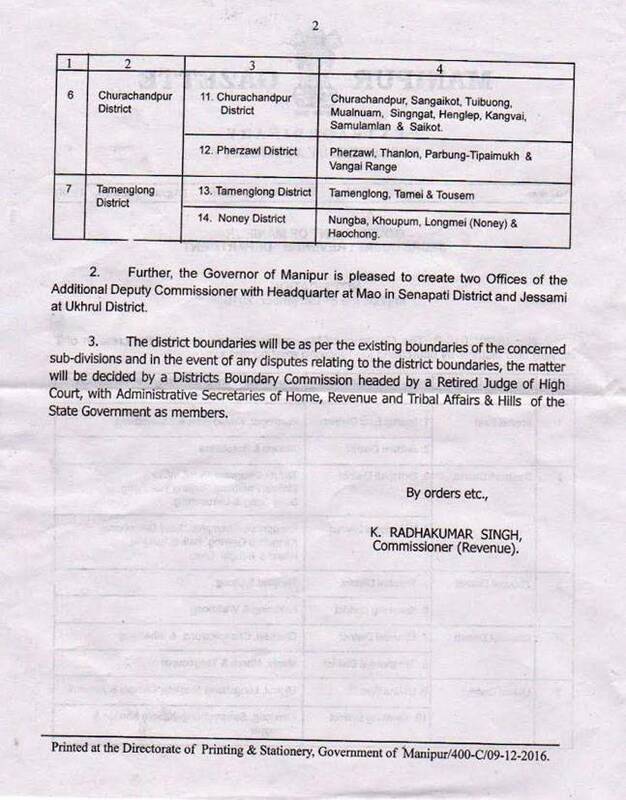 The newly-created districts are Tengnoupal, bifurcated from Channel district, Kampong from Ukhrul, Pherzawl from Churachandpur, Kangpokpi from Senapati and Jiribam from Imphal East districts. The deputy commissioners and Superintendents of Police of the newly-created districts have also been posted. The creation of these districts comes in the wake of the ongoing indefinite economic blockade enforced by the United Naga Council (UNC), protesting against the creation of two districts, Sadar and Jiribam, alleging that the new districts would encroach the ancestral land of the Nagas. The state government denies the charge, stating that the move was purely aimed for administrative convenience and with no ulterior motives. Chief Minister Okram Ibobi Singh has been himself in favour of the decision and at the helm of affairs of all meetings in the past held on the issue. "For people residing in Sadar Hills, the news of the creation of Kangpokpi district is a long-cherished dream having come true. The people of Kangpokpi ecstatically danced all night, on the national highway that runs through Kangpokpi," said Kamboi, a Kangpokpi-based journalist. For the residents of Sadar Hills, the creation of the new district comes after a long struggle and at the cost of 7 lives lost during the agitation for the same. After the announcement, people remain anxious as they are not ruling out the possibility of repercussions from the UNC that has spearheaded the agitation against the move, on the pretext that new district borders have divided the ancestral Naga areas.